Born in Salisbury Township, Lehigh County, Pennsylvania on 4 November 1823 (alternate birth date: 14 October), Aaron Fink was a son of Solomon Fink (1792-1868), and Susanna (Schleider) Fink, and the grandson of Peter and Maria Elizabeth Fink.He was baptized at the Moravian Church in Emaus (now spelled “Emmaus”) in Lehigh County, Pennsylvania on 1 February 1824. During his formative years, Aaron Fink resided in Lehigh County with his parents and siblings: Hanna (1813-1910; approx. years of birth and death), Johannes (1815-1900, approx. years of birth and death), William (1817-1887), Andreas J. (1819-1865; also known as “Andrew”), Caroline (1825-1897), Sarah (1828-1887), Ephraim (1830-1908), Matilda (1833-1884), and Charles Henry Fink (1835-1875). His sister Caroline went on to marry John Worman (1823-1901) while sister Matilda wed Gideon Kemmerer (1828-1913) and William I. Vogenitz (1831-1881). Aaron and Andrew Fink, shoemakers in Allentown, asked their customers to settle their overdue accounts (Der Lecha Caunty Patriot, 6 March 1848, public domain). At the age of 22, Aaron Fink also wed, taking as his bride a native of Whitehall Township in Lehigh County – Maria Anna Kemmerer (1826-1913). Born on 19 May 1826, Maria Anna was a daughter of Solomon and Magdalena Kemmerer, and was known more commonly as “Mary.” The Rev. Samuel Hess officiated at Aaron and Mary Fink’s wedding ceremony in the Northampton County community of Hellertown on 5 May 1845. But all was not smooth sailing during this early years. 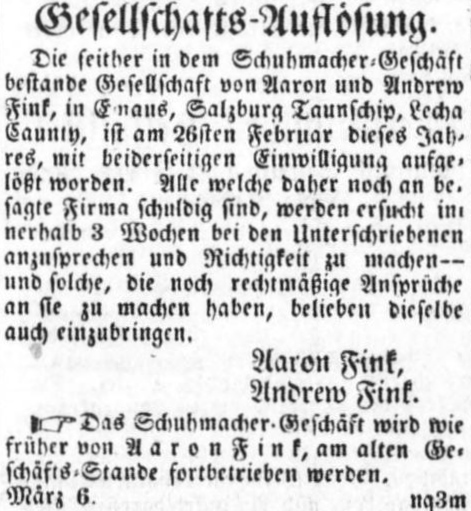 In 1848, newspapers alerted readers that Aaron Fink and his older brother, Andreas, were frustrated by customers who owed money to their shoemaking firm for services which had already been completed. Roughly translated, these notices stated that they would greatly appreciate it if those customers whose accounts were in arrears would pay their bills without further delay. Fortunately for the pair, business in the Lehigh Valley apparently picked up enough for for the Fink brothers to keep at it. According to the 1850 federal census, both brothers were still working in the trade and, by the start of the next decade, Andrew’s son and Aaron’s nephew – Alvin Fink, was apprenticed to Andrew (who was described on the 1860 federal census as a Master Boot and Shoemaker). As their business grew, so did both brothers’ families. On 21 April 1850, slightly more than five years after they were married, Aaron and Mary Fink greeted the arrival of their first child, George S. Fink (1850-1933). A second son, “Pharus,” arrived sometime around 1852. Shown on the 1860 federal census, but not listed on other census records or in the U.S. Civil War Pension paperwork for Aaron and Mary Fink, Pharus appears to have died in childhood (before 1870). By the dawn of the next decade, Aaron Fink and his family were residing in Mauch Chunk (now Jim Thorpe) in Carbon County, Pennsylvania, according to the 1860 federal census. They apparently returned to Allentown by 1861, however, because Aaron Fink’s Civil War records noted that he was a resident of that borough at the time of his enlistment for military service. The children present in the 1860 Fink household were: George (aged 10), “Pharsus” (aged 8), and Alfred (aged 1). The residents of Pennsylvania’s Lehigh Valley were treated, during the first quarter of 1861, to a steady barrage of news regarding the rising tensions between America’s North and South. 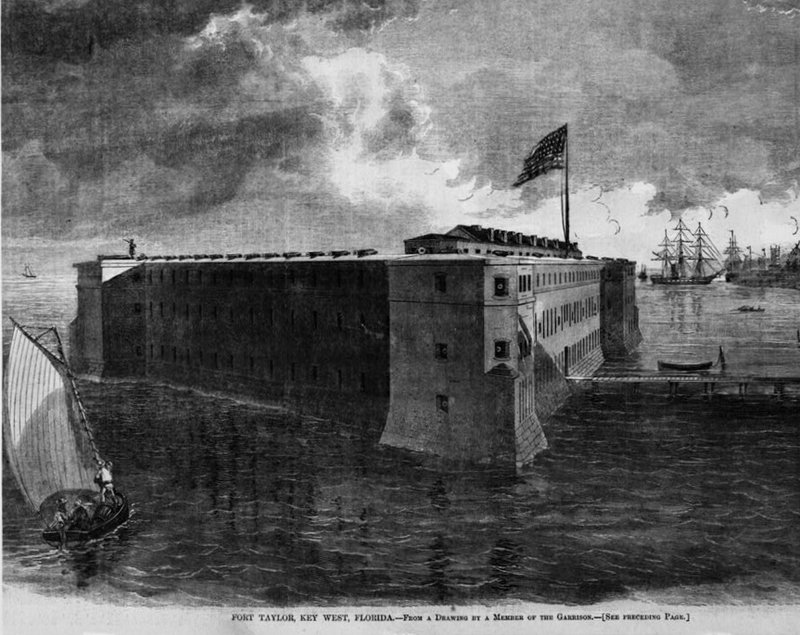 On 17 April 1861, German-speaking Allentonians learned that Fort Sumter had fallen to Confederate forces just days earlier. Der Lecha Caunty Patriot delivered the news with the headline, “Der kreig begonnen!” (“The war started!”), and continued with regular coverage of the Civil War’s progress. Aaron Fink became one of those men who enlisted that first Civil War summer. Enrolling on 20 August 1861 at Allentown, he officially mustered in for duty on 30 August at Camp Curtin in Harrisburg, Dauphin County as a Corporal with Company B of the 47th Regiment, Pennsylvania Volunteer Infantry. This newly formed regiment was founded by Colonel Tilghman H. Good, who later went on to become a three-time mayor of Allentown. Company B, one of the first two of four companies from the city of Allentown to muster in with the regiment, was raised and led by Emmanuel P. Rhoads, grandson of Peter Rhoads, Jr., a former Northampton Bank president. E.P. Rhoads had performed his Three Months’ Service during the opening days of the war as a First Lieutenant with the Allen Rifles, a respected local militia unit which helped to defend the nation’s capital as part of Company I of the 1st Regiment, Pennsylvania Infantry. Military records at the time of his own enlistment described Corporal Aaron Fink as a 37-year-old shoemaker and resident of Allentown who was 5’7″ tall with black hair, gray eyes and a dark complexion. On 24 September, Corporal Aaron Fink became part of the federal military service, mustering in with great pomp and gravity to the U.S. Army with his fellow 47th Pennsylvanians. Three days later, on a rainy 27 September, the regiment was assigned to Brigadier-General Isaac Stevens’ 3rd Brigade, which also included the 33rd, 49th and 79th New York regiments. By that afternoon, the 47th Pennsylvania was on the move again. 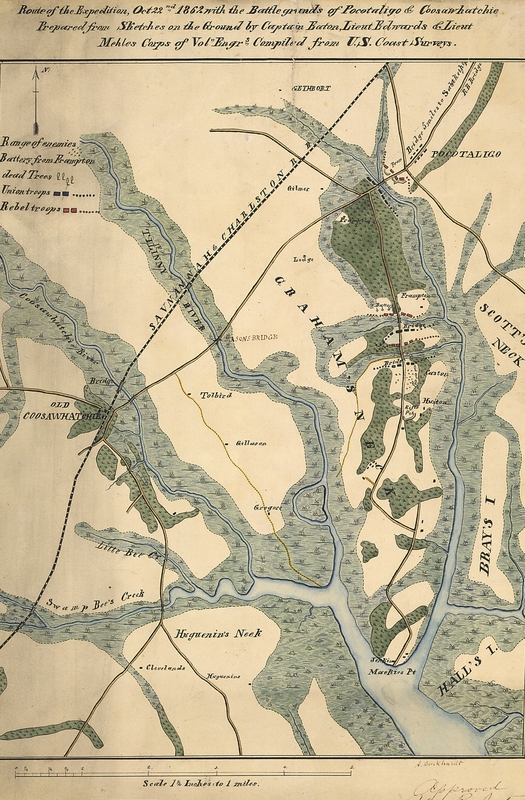 Ordered onward by Brigadier-General Silas Casey, the Mississippi rifle-armed Keystone Staters marched behind their regimental band until reaching Camp Lyon, Maryland on the Potomac River’s eastern shore. At 5 p.m., they joined the 46th Pennsylvania in moving double-quick (165 steps per minute using 33-inch steps) across the “Chain Bridge” marked on federal maps, and continued on for roughly another mile before being ordered to make camp. The next morning, they broke camp and moved again. Marching toward Falls Church, Virginia, they arrived at Camp Advance around dusk. There, about two miles from the bridge they had crossed a day earlier, they re-pitched their tents in a deep ravine near a new federal fort under construction (Fort Ethan Allen). They had completed a roughly eight-mile trek, were situated fairly close to Union General W. F. Smith’s headquarters, and were now part of the massive Army of the Potomac. Under Smith’s leadership, their regiment and brigade would help to defend the nation’s capital from the time of their September arrival through late January when the men of the 47th Pennsylvania would be shipped south. Sometime during this phase of duty, as part of the 3rd Brigade, the 47th Pennsylvanians were moved to a site they initially christened “Camp Big Chestnut” for the large chestnut tree located within their lodging’s boundaries. The site would eventually become known to the men as “Camp Griffin,” and was located roughly 10 miles from Washington, D.C.
On 21 November, the 47th participated in a morning divisional headquarters review by Colonel Good, followed by afternoon brigade and division drills. According to Schmidt, “each man was supplied with ten blank cartridges.” Afterward, “Gen. Smith requested Gen. Brannan to inform Col. Good that the 47th was the best regiment in the whole division.” As a reward – and in preparation for bigger things to come, Brannan obtained new Springfield rifles for every member of the 47th Pennsylvania. 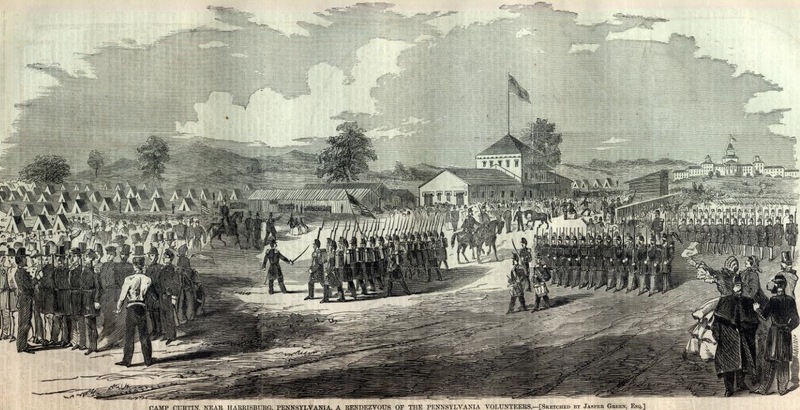 The frequent marches, coupled with guard duty in rainy weather, gradually began to wear the men down, and a number of 47th Pennsylvanians fell ill with fever. Several contracted Variola (smallpox), which also felled Confederate troops stationed nearby. Sent back to Union Army hospitals in Washington, D.C., at least two members of the 47th died there while receiving treatment. Next ordered to move from Virginia back to Maryland, the 47th Pennsylvania Volunteers left Camp Griffin at 8:30 a.m. on Wednesday, 22 January 1862. Marching through deep mud with their equipment for three miles, they reached the railroad station at Falls Church, and were then shipped by rail to Alexandria. From there, they sailed the Potomac via the steamship City of Richmond to the Washington Arsenal, where they were reequipped, and marched off for dinner and rest at the Soldiers’ Retreat in Washington. Corporal Aaron Fink and his fellow 47th Pennsylvanians arrived in Key West in February, and were assigned to garrison Fort Taylor. During the weekend of Friday, 14 February, the regiment introduced its presence to locals as it paraded through the streets of the city. That Sunday, a number of the men satisfied their spiritual needs by attending services at local churches. While here, the men of the 47th drilled in heavy artillery and other tactics – often as much as eight hours per day. They also felled trees, built roads and strengthened the installation’s fortifications. Their time was made more difficult by the prevalence of disease. Many of the 47th’s men lost their lives to typhoid and other tropical diseases, or to dysentery and other ailments spread from soldier to soldier by poor sanitary conditions. As the first embers of Spring were sparking back home in the Lehigh Valley, Aaron Fink’s wife and young sons greeted the arrival of their family’s newest addition – Corporal Fink’s daughter, Mary Malosina Fink, who was born in Allentown on 1 April 1862. 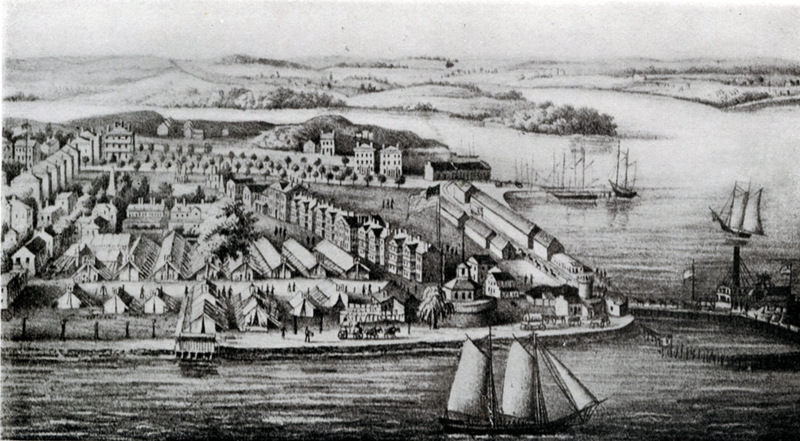 On 30 September the 47th was sent on a return expedition to Florida where B Company participated with its regiment and other Union forces from 1 to 3 October in the capture of Saint John’s Bluff. Led by Brigadier-General Brannan, the 1,500-plus Union force disembarked from gunboat-escorted troop carriers at Mayport Mills and Mount Pleasant Creek. 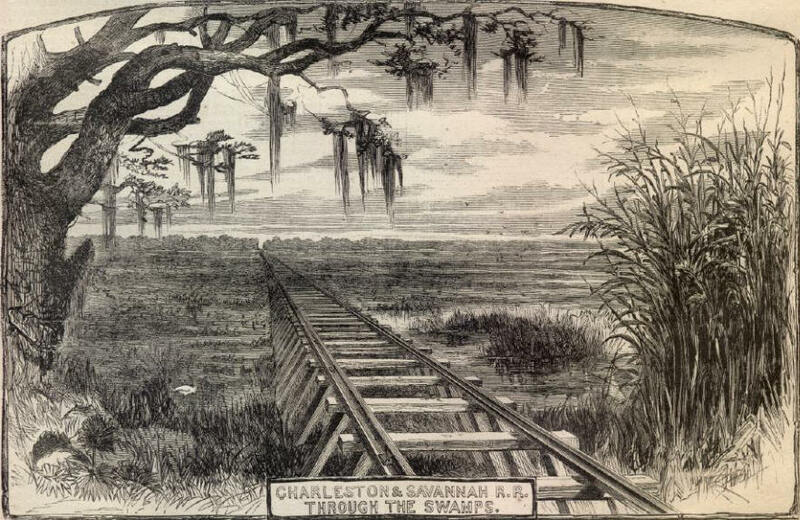 With the 47th Pennsylvania in the lead and braving alligators, skirmishing Confederates and killer snakes, the brigade negotiated 25 miles of thickly forested swamps in order to capture the bluff and pave the way for the Union’s occupation of Jacksonville, Florida. From 21-23 October, the 47th engaged Confederate forces in the Battle of Pocotaligo, South Carolina. Landing at Mackey’s Point under the brigade and regimental commands of Colonel Tilghman H. Good and Lieutenant Colonel George W. Alexander, the men of the 47th were placed on point once again. This time, however, their luck ran out. Their brigade was bedeviled by snipers and faced massive resistance from an entrenched Confederate battery, which opened fire on the Union troops as they headed through an open cotton field. Corporal Aaron Fink and others from his regiment who were trying to reach the higher ground of the Frampton Plantation were pounded by Confederate artillery and peppered by minie balls fired from the rifles and muskets of Confederate infantrymen hidden in the surrounding forests. In spite of the mortal danger they faced, the 47th Pennsylvanians and other Union troops grappled with the Confederates where they found them, and pursued the Rebels for four miles as they retreated to the bridge. There, the 47th relieved the 7th Connecticut. But the enemy was just too well armed. After two hours of intense fighting as they attempted to take the ravine and bridge, depleted ammunition finally forced Union leaders to order the 47th to withdraw to Mackey’s Point. Losses for the 47th Pennsylvania at Pocotaligo were significant. Two officers and 18 enlisted men died; another two officers and 114 enlisted were wounded – several of whom were injured so grievously that they could no longer continue serving. U.S. General Hospital, Hilton Head, South Carolina, c. 1861-1865. Built facing the ocean/Port Royal Bay (Broad River). Medical director’s residence, left foreground (U.S. Library of Congress, public domain). One of the fallen that day was Corporal Aaron Fink. Shot in the right leg during the heavy fighting at the Frampton Plantation on 22 October 1862, he was treated as best as his on-the-move comrades and regimental surgical personnel could before being removed from the scene of battle and stabilized behind Union lines – and then on to the Union Army’s General Hospital at Hilton Head, South Carolina for more advanced care. This entry in the U.S. Register of Deaths of U.S. Volunteer Soldiers confirms the 5 November 1862 death from gunshot wounds of Corporal Aaron Fink, 47th Pennsylvania Volunteers (public domain; click twice to enlarge). * Note: While some records note that Aaron Fink was shot in the right leg, his wife stated in a U.S. Civil War Widow’s Pension affidavit that he had been wounded below the knees in both legs. Confusion regarding a soldier’s status was not unusual in those early days.The federal government had not had effective plans in place for identifying and burying soldiers when the first massive bloodletting occurred at Antietam, and even after records management improved, there were still often errors because physicians, army clerks and chaplains were dealing with carnage on an unimaginable scale. 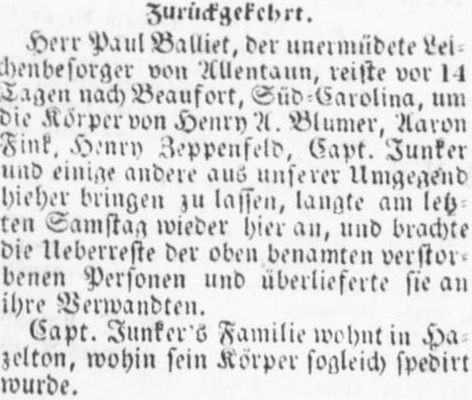 Mr. Paul Balliet, an Allentown undertaker and some others from our towns here, arrived last Saturday after a 14-day trip to Beaufort, South Carolina to bring back the bodies of Henry A. Blumer, Aaron Fink, Henry Zeppenfeld, and Capt. George Junker, and return the bodies of these aforementioned men to their relatives. Capt. Junker’s family lives in Hazelton, where his body was immediately interred. Corporal Aaron Fink’s widow eventually recovered from her shock and rebuilt her life.The three young Fink children also survived, and grew to adulthood. 2. Bates, Samuel P. History of Pennsylvania Volunteers, 1861-5. Harrisburg: Pennsylvania State Archives. 3. Bornman, Mrs. Maria Anna and Conrad Bornmann, in Funeral Ledgers, in Emmaus Moravian Church Records, in Historic Pennsylvania Church and Town Records (Reel: 539). Philadelphia: Historical Society of Pennsylvania. 4. Bornman, Mary A., in Old Moravian Cemetery burial records, in Historic Pennsylvania Church and Town Records (Reel: 562). Philadelphia: Historical Society of Pennsylvania. 5. Fink, Aaron (Veterans’ Grave Registration Record), in Civil War Grave Registrations Collection, Whitehall Township Public Library, Lehigh County, Pennsylvania. Harrisburg: State Library of Pennsylvania. 6. Fink, Aaron, in Civil War Veterans’ Card File. Harrisburg: Pennsylvania State Archives. 7. Fink, Aaron, Mary Fink and Mary A. Bornman, in Probate Records, 1863. Allentown: Lehigh County Register of Wills. 8. 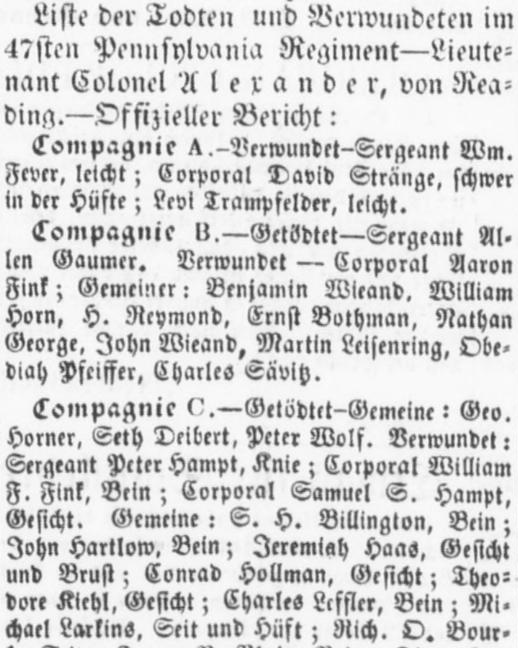 Fink, Aaron, in Registers of Deaths of Volunteers, U.S. Adjutant General’s Office. Washington, D.C.: U.S. National Archives and Records Administration: 1861-1865. 9. Fink, Aaron and Mary (Kemmerer) Fink, in U.S. Civil War Widows’ Pension Files. Washington, D.C.: U.S. National Archives. 10. Fink Family Birth, Marriage and Burial Records (various churches in Lehigh County, etc. ), in Historic Pennsylvania Church and Town Records). Philadelphia: Historical Society of Pennsylvania. 11. Fink Family Death Certificates (Mary M. Becker, George S. Fink). Harrisburg: Commonwealth of Pennsylvania, Department of Health, Bureau of Vital Statistics. 12. Schmidt, Lewis. A Civil War History of the 47th Regiment of Pennsylvania Veteran Volunteers. Allentown: Self-published, 1986. 13. U.S. Census. Washington, D.C. and Pennsylvania: 1840, 1850, 1860, 1870, 1880, 1900, 1910, 1920, 1930, 1940. 14. Zurückgefehrt, in Der Lecha Caunty Patriot. Allentown: 3 December 1862.